Growing up there were three of us kids, and our first allowance was tiered 50/35/25 cents, oldest to youngest. At age seven a quarter per week was fine by me. That was a quick trip to 7-11 on my Wards knock-off Stingray for some Lik-m-aid or candy cigarettes. But when adolescence rolled around a quarter just wasn’t cutting it. I wanted records and music magazines. Those were my only vices, but they were expensive vices. Old farts are supposed to wax nostalgically about the gold old days when you could buy a Chrysler Imperial for eight dollars, but this simply isn’t the case for albums. When I was a kid the average price of a new LP was eight bucks or so. That spiked up to fifteen dollars in the mid-80s when CDs came along, and now that the music industry is imploding it isn’t uncommon to see new releases back in the eight to ten-dollar range. This means that in real terms music was significantly more expensive back when I was in the target demographic for Van Halen II. Consider this: When the federal minimum wage was $3.35 per hour I had to work 2.5 hours to afford an eight dollar record. Now with the federal minimum wage at $7.25 per hour, that same burger flipping kid only has to work about half that to afford a ten-dollar new release. Keep that in mind the next time you hear the record labels blaming everyone but themselves for their downfall. They created the market for illegal copies/downloads by pricing their target customers out of their market. I’m not condoning the practice of illegal downloading. Recorded music is at its heart an industry and those who work in that industry deserve to be paid for their services. My point is simply this: If you can afford to sell a new release for ten bucks in 2011 you could’ve afforded three bucks in 1981, you greedy bastards. If your product doesn’t need to keep up with inflation then you’ve been gouging your customers. Don’t be surprised when they turn on you like a pack of vicious wolves in Bullet For My Valentine t-shirts. Yes, the internet has put tremendous pressure on your business, but you’re aware that you created the market conditions that resulted in that tremendous pressure, aren’t you? There are many types of music customers, ranging from the casual listener with a Titanic soundtrack to the obsessive compulsive freak who needs it all. The former will gladly download a Ke$ha track for a buck (or illegally), but the latter wants in. He (and it is usually a he) doesn’t want music, he wants to be a part of something. It’s not just the songs, it’s the whole package – the artwork, the liner notes, the lyric sheets. The bonus tracks, demos, bootlegs, b-sides, limited editions, and imports. The singles, tributes, picture discs. I’m one of these guys. At last count I owned ninety-two David Bowie CDs – just CDs. Bowie has released only twenty-five studio albums, and I own nearly four times as many CDs. The Clash, Iggy Pop, Led Zeppelin, Queen, The Police, Townshend and The Who, on and on. Once I’ve hitched my wagon to an artist I want the complete catalog. There are some mighty challenges out there. One day I will own the complete Miles Davis and the complete Frank Zappa, for example. Notice I didn’t say “I will own mp3 copies of Miles and Zappa.” That’s not how the music geek’s brain functions. And because that’s how the music geek thinks, I’ll never own the complete anything. The labels are onto the likes of me. I think they’ve given up on the casual listener, tossed them into the iTunes well. Like some sort of Tea Party they focus their energy on extremists like myself. At one end of the maniac spectrum are the preadolescents who have to show their solidarity with Justin Beiber or Katy Perry or whomever happens to be playing the Beatlemania role this week. I suspect that these purchases are often made by parents who are solving their own childhoods when Daddy wouldn’t spring for Sean Cassidy’s Born Late because “that fairy couldn’t sing his way out of a paper bag.” No, I’ll buy Madison the new Justin Beiber and she will love me because I’m the cool parent. (My hands aren’t clean here. I took my daughter to a High School Musical concert.) At the other end of the spectrum are balding old farts with discretionary income and the complete Bowie discography. I must look like a wounded antelope to a record exec: fat wallet, glazed expression, flipping through the bins looking for anything I don’t already own. How do they keep the completists coming back? They keep issuing the same record over and over. Let’s limit ourselves to the domestic releases of a single record: David Bowie’s Station to Station. First there was the original vinyl LP, then in 1985 RCA rushed out a horrible CD version to catch the first CD wave. The sound was horrible, and it became collectible for no other reason than it wasn’t on the market for very long. Bowie’s RCA CDs were of such poor quality that he took his ball and went home, home being Ryko Records. Ryko rereleased the whole Bowie catalog (minus the eponymous Deram debut album) in beautiful editions and with outstanding bonus tracks. But wait – they also release AU20 editions of the same CDs for the audiophiles. We’re at four releases of the same record now. Eventually Ryko’s contract with Bowie ended and he fired up shop with EMI. 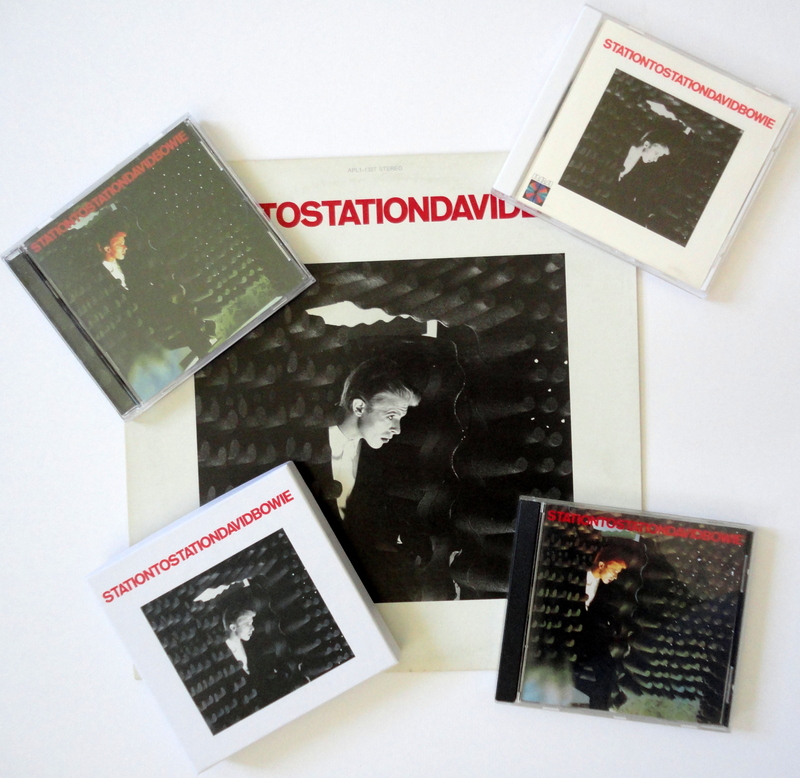 This fifth release of Station to Station was back to the original track listing, but a new release means a new mix or remastering. Maybe I’ll hear something I haven’t heard before, got to have it. Finally – for now, anyway – last year saw the release of a thirtieth anniversary edition, which included a great booklet and a bonus disc of a 1976 concert. That’s six purchases of a single piece of intellectual property. Am I complaining? No, I think it’s brilliant. I don’t mind buying Live at Leeds again if this time I get The Who’s actual Leeds show. If I could afford six Dali paintings I wouldn’t stop at one and resent the other five. Gimme gimme gimme! Where does this compulsion come from? I have an acquaintance who claims to own over 2,000 Grateful Dead recordings. That hurts my head. I own one, a tribute album, and only because Jane’s Addiction appeared on it and I must have the complete Jane’s Addiction. My son, who is of prime download age, plunked down fifty bucks for a Slipknot CD that he already owned because it came packaged in a steel lock box with t-shirt, buttons, stickers, and a key ring. I don’t know where music obsession comes from but for me personally I know where it started, and that’s a story that is long overdue. It’s not a unique story by any means, but it’s mine nonetheless. Get out your seven-inch leather heels: we’re headed into KISS territory. 14. What Time Is It? Absolutely love your breakdown of how the music industry gouged the consumers for years. From a visual standpoint, all it took was a fifteen year old article interview with Mariah Carey when she was married to Tommy Mottola. The photos of her proudly showing off a closet three times the size of my house told me what I needed to know. Sony Records was never going to hurt for cash in this lifetime, ever. Cry all you want, a**hats. Now, I confess. I like to think I am a fairly nice person, but I admit I snickered when I read that you attended the ‘High School Musical’ concert. For a childless fellow, he seems to have a sympathy gene that does not come naturally to me. Maybe it’s having one niece and three nephews all under fifteen years old. He has seen and heard much more than I. As for the insanity of the collections? The “must have it-itis”? I know who started mine, where it started, and why. I know what it morphed into. Those that have it (and there are a lot of us) are not unique, but each story is. I will put aside my American V8 and leather jacket for now, and patiently wait, seven inch platform heels by my side. Tomas is a wise, wise man. I hope to hear your must-have-it-itis story someday. The fun is in the sharing. I’m far too eclectic to be a collectoholic but I came close with KISS but then I got married and sold all my vinyl, and it was just never the same with CD’s. These days, if I like something, I buy it, but theres far too much other stuff out there to concentrate on just one flavour. As for dirtying ones hand in the pool of poptastic crap, all in the name of fatherhood, my biggest crime was taking the sweet young things to the Disney Channel Kids TV Awards back in 2002 and being treated to the wonders of Blue, A1, Five, Busted and Junior S Club7. To top it all off, and to coincide with the recent release of the movie ‘Monsters Inc’ the producers decided it would be cool to see if they could get in the record books with the worlds loudest audience participatory scream. They even dragged Norris McWhirter in to adjudicate! I think it failed because I actually refused to take part 🙂 But that was a painful experience, made only slightly less so by the brief appearance of the lovely Holly Valance. But really? 92 Bowie CD’s? ?